What if you could clear up your acne without special cleansers or medication, and without regular visits to the dermatologist? There would be no pain, either. You would begin to see results as soon as a few days after you start treatment. This revolutionary way of curing acne harnesses the power of blue light to kill the bacteria that causes pimples. This bacteria, Propionibacterium acnes, clogs your pores and causes inflammation. But blue LED light causes the p. acnes to self-destruct. It may take a few sessions to get all the bacteria, but your pores will return to normal and your skin will produce less oil. You can visit a dermatologist for intensive sessions that could work a little faster, or you can do treatments at home with an approved device. Either way is effective because blue light therapy for acne doesn’t hurt and it really works. Who can benefit from blue light therapy? If you have red pimples from inflammatory acne, blue light therapy is ideal for you. If you have cystic acne, it won’t work. If you aren’t sure which kind you have, consult with your doctor before beginning treatment. Who should avoid blue light therapy? We’re glad you asked because this is important. Some people should not do blue light therapy. For example, if you already take Accutane, please talk to your doctor first. Also, if you have lupus, epilepsy, albinism, or you’re pregnant, don’t try this treatment for your pimples. If you’re taking retinol, St John’s Wort, antibiotics, or anything else that makes your skin sensitive to light, talk to your doctor. You may need to stop taking those at least a week before you begin light therapy. Does blue light therapy work for everyone no matter their skin color? Happily, yes, blue light therapy works for everyone. It doesn’t matter what your skin color is. In fact, light therapy is a blessing for people with darker skin who end up with very dark spots after a breakout. Check out this medical study where a patient combined blue light therapy with hydroquinone cream. What’s the difference between blue light therapy at the dermatologist’s office and at home? Dermatologists have more powerful LED lights they use in their offices. The lights are larger so they cover more skin at once. If you have severe acne, consider visiting a dermatologist first. They can give your treatment a jump start. Then you can to finish and maintain your skin at home with your own device. Yes, blue light therapy is very safe, even if you do treatments at home. The lights don’t get hot so you won’t burn yourself. Many devices sold for this purpose are cleared by the FDA. Is blue light therapy expensive? If you visit a dermatologist for LED light therapy, plan on paying anywhere from $150 to $300 a session. Now compare that to the average cost of a home use device like one of the ones we review below. One device costs as much as one visit. It’s definitely more economical to buy your own skin rejuvenation device. You just have to commit to doing your own treatments at home. On that note, let’s dive into the list of the best blue light therapy anti-blemish devices for home use. Here is where we’ll review the top blue light skin rejuvenation devices for you to use at home. We’ll start with one of the best handheld blue LED therapy models. The Baby Quasar MD Blue is a safe and painless way to cure acne and heal your skin. It comes with a 90-day satisfaction guarantee. If you don’t see results, you can return it for a refund. It also comes with a lifetime no-questions-asked warranty. The light emitted by the Baby Quasar MD falls into blue spectrum with wavelengths between 415 to 420nm, the strongest part to kill bacteria in your pores so the redness and swelling disappears from your skin. All you have to do is hold the light against your skin for a few minutes a day. No scrubbing, no squeezing, no damage to your skin. The FDA considers the Baby Quasar MD Blue as a safe-to-use Class II medical tool. It doesn’t age your skin because it does not emit ultraviolet light like a tanning bed. It’s made for home use so you don’t need the supervision of a doctor to try it. With a home use device, you’ll save money by not needing to buy expensive medications for your skin. You won’t need to pay for trips to the dermatologist. The Baby Quasar MD has proven to be effective at treating acne and skin blemishes. And this tool is made to last: the housing is made of rugged anodized aluminum. Compare that to the plastic that houses some of their competitor’s models below. The LED lights that kill the bacteria are rated for up to 50,000 hours of use. That means they could be used half an hour a day for over two hundred years before they burn out. If you have other people at home who want to try this device, pop on the clear protective lens cap and let them try it, too. It comes with a travel pouch so you don’t ever have to leave it behind. If you have any questions, Baby Quasar has free customer support through email or a toll-free number. LightStim is another top brand name in light therapy. Their professional grade machines are found in many dermatologists’ offices around the world. Now they sell handheld home use devices like the LightStim for Acne. LightStim says they base their technology on research done by NASA about healing skin wounds in space. 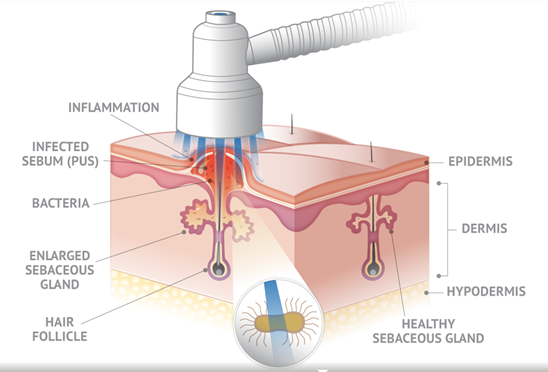 The LightStim for Acne emits more than just blue light, it also uses the red end of the spectrum. They call this combination MultiWave. Not only does it kill bacteria, it helps skin heal faster. The LightStim handheld device has been cleared by the FDA for treating mild to moderate acne on any skin type. Download their free app that includes a timer for keeping track of your treatments as well as tips for skin care. If you like the Baby Quasar MD Blue but want something a little more portable, the CLEAR RAYZ may be a good option for you. It has a built-in timer so it keeps track of your treatment time for you. CLEAR RAYZ has both red and blue lights. In fact, its face is packed with 42 blue and 40 red LEDs. Two pushes of the button turns on the blue, one push turns on the red. Baby Quasar says to treat your face one day with blue for 20 minutes, the next day with red for 30 minutes. They recommend covering your whole face section by section with gentle circular motions. Like other products from Baby Quasar, this one comes with a 90-day satisfaction guarantee plus a 5-year warranty. Conair has released their True Glow Light Therapy Solution as a low-cost alternative to pricier devices. It has just 24 LEDs, but Conair says these are medical-grade anti-acne lights. While it may not be as powerful as some of the other models we’re reviewed, it has one thing going for it. It’s truly portable. While many light therapy devices require electricity, the Conair does not. It can run off three AA batteries for true portability. You can also run it from your phone charger with the included USB cable. Besides the Conair, the Tanda Zap is also completely portable. It runs on three AAA batteries. Besides its acne-killing blue light, the Zap vibrates for two minutes at a time. When it stops, you’re done in that spot. You can repeat the treatment up to three times a day. Tanda designed the Zap for eliminating acne in small areas, so if you only have a couple of zits at a time, this could be the ideal portable device for you. From Tria Beauty comes the Positively Clear 3-Step Acne Solution, or as they like to post, #bluelightit. First, use the foam cleanser on your skin. Second, use the light. It has a built-in timer that shuts off after 5 minutes. Third, apply the spot treatment cream. Again, this is another product best used on small areas. It’s very portable and easy to use. Tria Beauty said their users report better skin in 2 to 8 weeks. The device comes with a 1-year warranty. Handheld blue light devices are convenient because they are portable and can be used anywhere you want to spotlight acne on your body. But hands-free devices like panels and masks have their own appeal. Let’s review the top light therapy machines that you don’t need to hold during treatments. Trophy Skin has been in business since 2010 with the goal of providing less expensive but effective light therapy skin care treatments at home. Their Blue MD can be used while you’re seated in front of it or while you’re lying down. They recommend washing your skin first and drying it gently but thoroughly. You can use serums and creams after the light therapy treatment. Then place the panel no more than 6 inches above the skin you want to treat. The panel is mounted on a flexible support, so it’s easy to adjust. If you’re exposing your face to the panel’s light, please wear the goggles they include in the box. Let the light shine on your skin for 5 minutes, three times a week for mild acne. If your acne is moderate to severe, begin by exposing it to light sessions twice a day. Norlanya also includes more than one part of the light spectrum in their Photon Therapy Machine, but you can only treat yourself with one color at a time. You can’t mix them like you can with the LightStim. This means your daily treatment may take longer, but you will get the full dose of each color. The LEDs in their panels are based on the following wavelengths: 470nm for blue, 630nm for red, and 590nm for yellow. There are 150 blue LEDs, and 135 each of red and yellow. The panel measures 13.78 inches wide by 8.27 inches tall, so it’s just about perfect to bathe your whole face in light at once. Plus, you can use it anywhere on your body. That’s good news for people who suffer with acne breakouts on their back and chest. You can set the Photon Therapy Machine to work between 5 to 20 minutes at a time. Norlanya explains that the blue light kills bacteria and reduces oil production. Red light stimulates the production of collagen to reduce wrinkles and make your skin look younger. Yellow light reduces discoloration and improves circulation. You can choose between two programs, one for daily care in the spring and summer and one for fall and winter. The Photon Therapy Machine comes with a one-year warranty. The Project E Beauty foldable panel looks a bit like Norlanya’s product, but the Skin Rejuvenation Treatment Machine mixes it up with even more colors of light. They cover a wider spectrum from 463nm blue through cyan 470nm, green 527nm, yellow 590nm, purple 600nm, orange 610nm, and red 630nm. With 420 LEDs total and a panel measuring about 12 by 7 inches in size, it’s almost as large as the Norlanya. Why all the colors? Project E Beauty says each color has its own role for treating your skin. Of course, blue kills the bacteria that creates pimples. Red helps get rid of wrinkles. And according to them, purple eliminates toxins, cyan relaxes your skin, green comforts it, yellow brings it oxygen, and orange brings balance. Project E Beauty offers a 1-year warranty against manufacturer defects. Besides their hands-free panel, Project E Beauty sells a Phototherapy Mask. It incorporates red, green, and blue LED light to tackle acne, wrinkles, and skin discoloration. The only downside is that since it’s a mask, you can really only use it on your face. Plus, it runs on electricity, so you can’t move around much while wearing it. It comes with a remote control and instruction manual. If you would prefer to do other things, instead of lying down or sitting still, while you treat your skin, the Neutrogena Light Therapy Acne Mask may be the perfect solution for you. It’s powered by a removable and replaceable Activator that’s good for thirty treatments of ten minutes each. Once the Activator runs out of juice, you can buy another one for another month’s worth of daily treatments. The Neutrogena mask uses blue light to kill off p. acnes bacteria. You can use it every day to keep your skin clear of blemishes. Our last blue light therapy treatment comes in the form of a small light bulb. The bulb is studded with thirty-eight LEDs emitting light at 415nm, which is perfect for killing the acne bacteria. Users report success when they screw this into desk lamp and bathe themselves in blue light for just a few minutes a day. It’s certainly a less expensive way to try out blue light therapy. But you will probably need to get within 6 inches of the lamp in order for the light to do its job. Please do plan on using goggles to protect your eyes when you use RubyLux LED bulb. Now, speaking of goggles, here are some accessories to make your light therapy treatments more comfortable. Please do purchase protective eyewear for use with your blue light treatments. Sunglasses aren’t good enough. Closing your eyes and placing a cloth over them isn’t a good long-term answer either. Plan on investing just a few more dollars because your eyesight is worth it. We highly recommend using protective eyewear when you do blue light therapy. These goggles from RubyLux are made to keep you safe so you don’t injure your retinas. They have an elastic band to ensure an appropriate fit for most users. The Oil-Free Acne Wash contains salicylic acid that also kills off acne bacteria. It works on blackheads, too. The pleasant scent comes from grapefruit extract, which reduces the amount of oil on your skin. The Acne Wash exfoliates gently as it cleans, which helps if you suffer from hyperpigmentation. Even with all this cleansing power, it doesn’t dry out your face. You can use it morning and night. Cetaphil’s Gentle Skin Cleanser is made for all skin types, not just oily skin. You can use it to wash both your face and body, which is especially nice for those who have acne on their chests and backs. It’s also recommended for just about all ages: children, teens, and adults. It’s hypo-allergenic, non-comedogenic, and has no scent. Besides acne, people suffering with psoriasis, rosacea, and eczema have benefitted from using the Gentle Skin Cleanser. It moisturizes and doesn’t strip off all the skin’s natural oil, but it does remove makeup and dirt. And one last thing—you can use it without water. After you complete your treatment each day, it’s time to moisturize your skin. It sounds crazy, but dry skin can actually develop more acne. It’s best to keep your skin happy. Cetaphil’s Dermacontrol Moisturizer is an award-winning moisturizer that is gentle enough to be used alongside prescription acne medications and under makeup. It evens out skin appearance by absorbing oil and calming irritated skin. Although it has a light texture, it takes a little while to absorb into the skin because it contains glycerin and that is a safe humectant for sensitive skin. Dermacontrol has no fragrance and contains no parabens. It is a sunscreen with SPF 30 protection against both UVA and UVB rays. A lot of sunscreens offer little or no protection against UVA. Neutrogena tackled this problem with their Clear Face Sunblock. It has a strong SPF 30 rating and it blocks both UVA and UVB rays. How does it work without clogging pores and causing acne? Neutrogena created “Helioplex,” a chemical combination of Avobenzone, Oxybenzone and DEHN. There’s no fragrance and no oil. To soothe skin, Neutrogena included cinnamon, cedar wood, and Portulaca Flower. The sunscreen goes on light, and a little goes a long way. It doesn’t leave a white residue or sticky film. It lasts up to 80 minutes in water if you go swimming, but needs to be applied again if you wipe off with a towel. NASA discovered that different colored lights could do everything from help astronauts grow plants to heal wounds quicker in space. You’ve probably heard that there are lights that treat people suffering from Seasonal Affective Disorder. In 2002, the FDA started clearing blue LED devices for medical uses. Why choose LEDs instead of regular blue light bulbs? LEDs last a lot longer than regular lights, up to years of constant use without failing. They are very powerful for their tiny size. Therefore, astronauts got to experiment with LEDs. You may have also heard that the blue light emitted by your smartphone and tablet can keep you awake at night. This is true. If you are especially sensitive to this, consider doing your blue light skin care therapy treatments in the morning instead of at night. With such a wide variety of products, how do you choose the best one for you? Let’s take a look at your needs. Do you want a portable device, or are you able to do treatments near an electrical outlet? Some people buy one of each, both battery and electrical, so they have one device for use at home and one for travel. How do you want to do your treatments? Would you prefer hands-free, or do you like to have control over the specific areas you’re treating? Of course, budget is often a factor in making decisions. But our advice is to buy the best product you can afford. You deserve it. Better products mean getting results sooner. Most of the devices in this review have a money-back satisfaction guarantee as well, so your risk is a lot lower. We hope you found the best blue light therapy device for you to get rid of acne. Check back soon for reviews of more of the best in personal care products.